Engraved Floral Wreath Recipe Box Give that special chef in your life a place to hold all their special recipes with our Engraved Floral Wreath Personalized Recipe Box. Personalize this recipe box with you choice of any name. Makes the perfect gift for any chef! 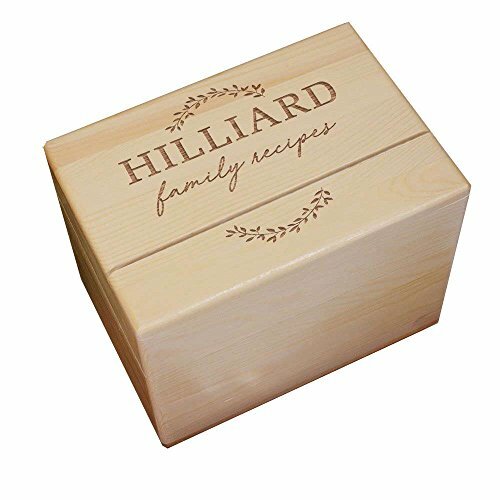 Recipe Box measures approximately 5.25" W x 6.75" L x 5.25" H; Interior Dimensions measure approximately 3.9" x 5.9"
Personalize this recipe box with you choice of any name. Makes the perfect gift for any chef! View More In Recipe Holders. If you have any questions about this product by GiftsForYouNow, contact us by completing and submitting the form below. If you are looking for a specif part number, please include it with your message. C.R. Gibson Kitchen Gear Recipe Binder Bundle with Bonus Refill Sheets & Recipe Cards, 3 Items. Recipe Binder measures 9" x 9.5"
C.R. Gibson Q2-20809 Recipe Box, 6.5" x 4.25" x 4.75"